I had heard of this concept for a while and was really impatient to find out more about it. The shop located on Tabellion road in Brussels, conceals what goes on inside rather quite effectively. The windows are inviting but do not provide any hint as to the nature of its business. 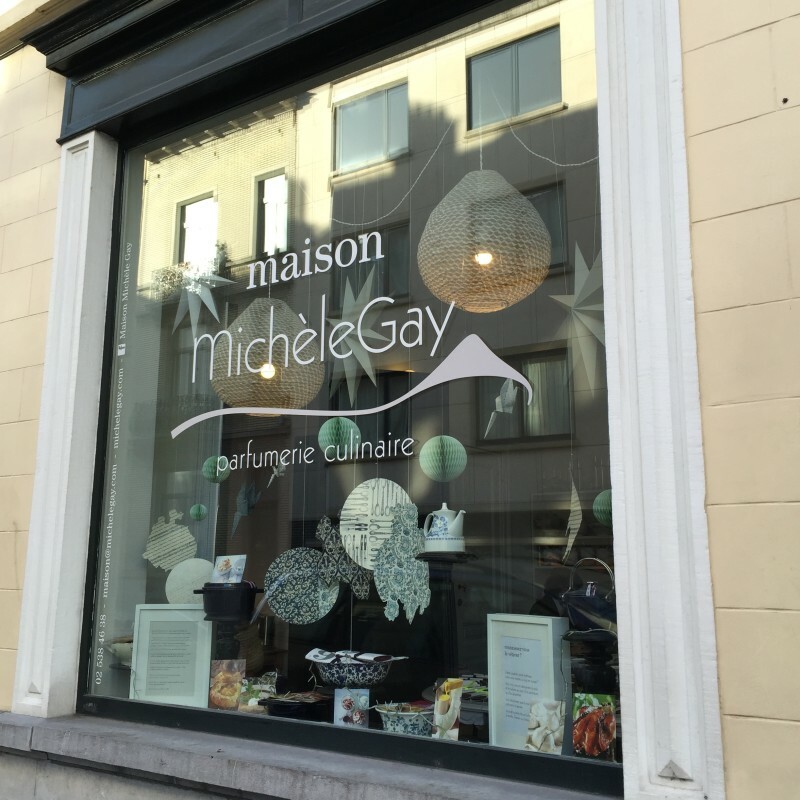 Only the sign, “Maison Michèle Gay, parfumerie culinaire (culinary perfumery)” arouses your curiosity, inviting you to open its doors. And that is what I did one grey January morning. 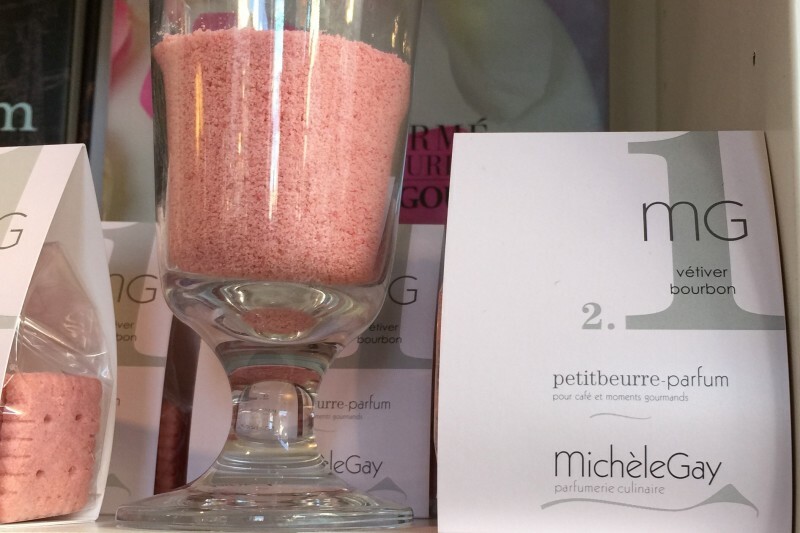 Michèle Gay patiently welcomed me and explained its concept to me in detail, her passion for perfumes and what lead her to create this revolutionary concept. 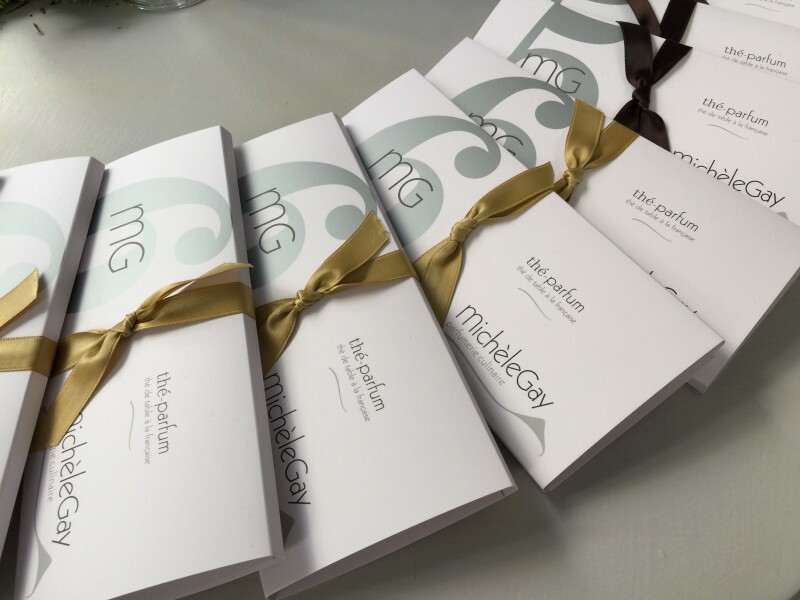 Michèle Gay displays an extraordinary creativity and a dynamism. Self-assured, she is aware of what she wants and is not afraid to break the rules and push the boundaries of what some refer to as “good taste”. She knows how to ask the magic question, “And why not?” All of which I love. 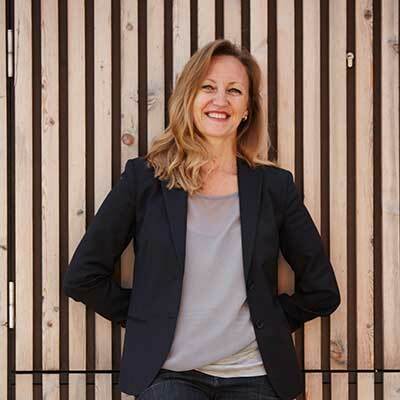 Michèle Gay you moved to Brussels only a short while ago, tell us how this adventure began. 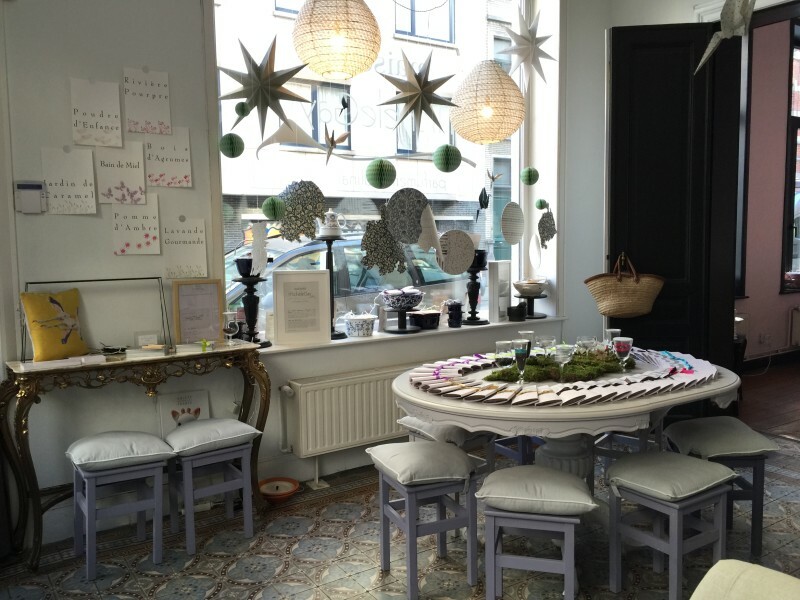 I arrived in Brussels in December 2014, to create this culinary perfumery. It is the first of its kind worldwide! I didn’t have a shop in Paris although I did work in this business discipline I have invented: culinary perfumery. It involves connecting the world of cuisine with that of perfumery. So I practiced this discipline for about 15 years in France, solely in event mode, B2B, training with perfumers and cooks, although I was not involved in interacting with the general public. As the years went by, I began to desire the experience of crossing over to the other side and interacting with the general public. My reason was simple enough: I wanted to bring an appreciation for food to the discipline I wanted to approach it from a notion of appreciation for food and less from an artistic, initiatory or even marginal plan. After all placing Vétiver on a plate is an act, a gourmet gesture: you add a quite a bit of cinnamon and ginger so why not vétiver and patchouli? When you speak of an appreciation for food and Vétiver, the main product is the little butter flavoured biscuits. It is really the archetype, the signature product. It is actually the classic little French butter biscuits, the delicacy from our schoolyards. We think about the Petits Lus with a butter flavour, a product of great quality from the outset, taken elsewhere with a different flavouring, which is neither vanilla nor cinnamon as might be imagined. But with starting notes of Davana, a flower from Reunion which develops slight notes of apricot, floral and fruity, a heart of vétiver and cedar wood, and then a rather spicy taste in its wake. We are really in this imaginary world of perfumed flavour. One of the specific features of this house is that you only find multiple flavours here, we are not involved in a flavouring like vanilla sugar, for example, but still with an aromatic composition which lingers in the mouth. We have a story which is unfolding and taking place with, typically like a brought perfume, head, heart and bottom notes. It is actually a language, a posture which finds its place between oenology and gastronomy with a search of emotions, sensations, memories and recollections. I was trained as a stylist, basically, rather an artistic dimension. Our quenelles are immutable, so imagine them with patchouli! We were not there at all! In spite of everything, this confectioner which was called la Potinière, had a catering-reception department, and it was a profession which I began to approach. And there, I discovered that there was a field of expression in cuisine, that there was also a rather receptive cuisine, where there was a need to express something else other than the simple act of feeding oneself. Culturally, in terms of education, I had not been raised in that world. I very quickly went to Paris to express my desires and leanings, using food materials rather than textile materials as I might have been destined to. I worked for about fifteen years with renowned caterers such as “Le Nôtre” more confidential caterers, communication agencies to design, provide an artistic perspective, on their approach to food, which had just accompanied an event, family celebration, etc. At these different jobs, I realized that what provided the memory and emotion of a recipe was not so much the culinary technique as the perfumes which signaled and which provided with precision a memory returning us to our own olfactory imagination. At first, I worked with what history had placed on a plate: the range of spices, tea, coffee and chocolate. And then more curious, a form of boldness also and then a passion for perfume, since my earliest childhood, had motivated me to study, and find out about the perfumery profession and its range relating to that of the chef. Actually observing that there were common ingredients, precisely this range of spices among some but not others. I began to search, to understand why certain spices had been left beside the plate and not others. And that was the beginning of a quest, a search, a personal step, which took me about a good ten years. I wanted to break down barriers for the sake of personal satisfaction, out of curiosity. And then afterwards, I had to find a technique, ingredients, good support, find support, experts, etc. I achieved that between 2006 and 2007, when my speech was relatively stable. It made sense: there were recipes, a formula; something was going on. There I turned in terms of caution towards the world of perfumery: I searched for support from the SFP, the French society of perfumers, where I was promptly accepted. 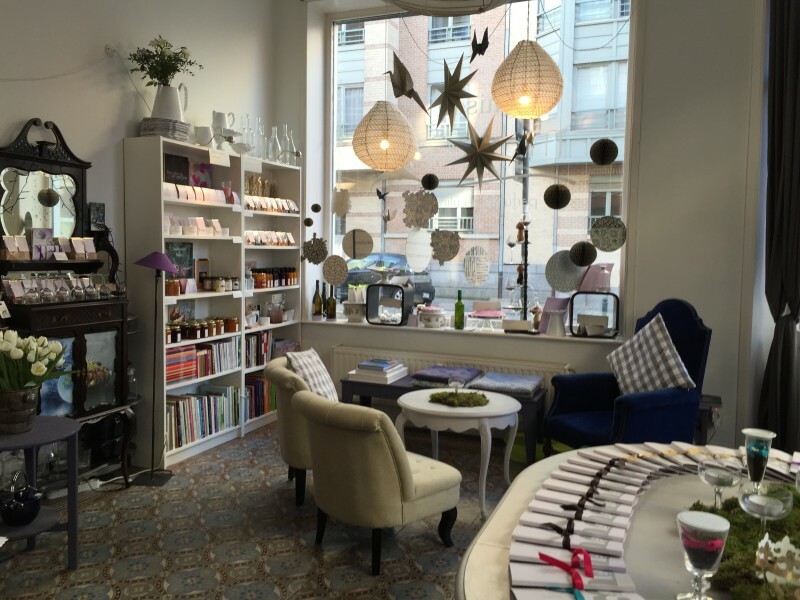 Did you undertake any training in perfumery? I did take short courses in it. I used basic techniques, specifically composition; I only use about 10% of it since I only make use of natural products. I left all the synthesis and chemistry aside. I was not necessarily interested in more than that. But on the other hand a lot of the history of perfumery, its culture. I obtained a lot of answers at ISPICA and at Versailles Osmothèque. I approached perfumers. We evaluated some of my perfumes together. We worked a lot. It was a really a personal step. Since my earliest childhood, I have struggled, against the obsession with good and bad taste, which exists in every domain, but which is especially present in cuisine. As for me, it is really a theory which I do not adhere to in the least. I think that everyone has their own taste. If I feel like adding vetiver to my camembert, then I shall, it’s my choice. Just like how I dress. I don’t tell anyone how to wear a hat, but I have my own way of wearing it. After all it is a suggestion like another. In any case, this culinary perfumery opens that field of expression. For each to propose their own way of doing things: it is the extension of a personality: No dictates, no taboos. If I feel like starting lunch with something sweet, because I feel like it right then, why shouldn’t I? I start with my chocolate tart and my blanquette will come afterwards, and nothing can stop me from doing so. In any case, there is no rational reason: it is a matter of culture, history and upbringing. But beyond that it is interesting to overturn and challenge these habits. How do you work? Do you have a set range? Absolutely. At present, we have two main activities and have just added a third one. We are close to the scoop! The first activity which I arrived with in Brussels, is the shop. A collection of culinary perfumes, placed in order of classic culinary usage: Everything which can be drunk is infused; everything which is the order of peppers and salts. There on this pretty flecked Marolles furniture, is what I call the heart of perfume: the signature products of the house, then we move to hybrid products, semi salty and semi-sweet. And then you have the entire range of sweets with of course the butter biscuits which are so popular, for snacking or sprinkling. It is interesting. Notably for sprinkling on desserts, because the extent to which texture is interesting and important in a flavour’s approach is observed. The brown sugar and icing sugar are a means of paying homage to Belgium. And what was your reason for actually coming to Belgium? To interact with the general public. I was also aware of the fact that France was too conservative and that I needed a public that was more curious, bolder and less enclosed in their culture. Is that your opinion of us Belgians? Absolutely. Quite clearly. I felt it whenever I used to spend weekends in Brussels and at the end of a year of activity, I confirmed it clearly. Then afterwards, a Belgian like a French person may like certain matches and not others. Again it is about personal choice and freedom. But they at least have no preconceived ideas: they will give it a try. While the French would have made up their minds: “how? What an absolutely ridiculous idea…!” Afterwards, if they happen to try it, they may occasionally be humble enough to admit they were wrong, that they were too quick in passing judgement, but that is really rare. And I mean it absolutely! At the same time, we, (the French) have the weakness of our strength. We have a culinary heritage which is a part of our history which we created and which also creates our image, and is difficult to change. Which is actually a part of the furniture. While in Belgium, there is all the same less of a culinary heritage – I do not think it is impolite to say so – there are many different cultures, different influences, so why not this? And that is fundamental in terms of approach. I consider it a passing phase of the shop. 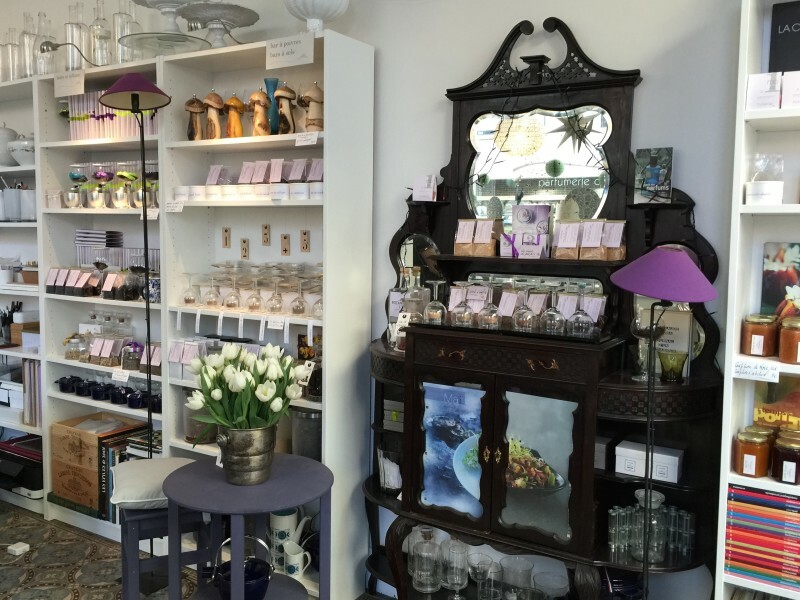 My shop’s windows make it seem relatively mysterious: there isn’t much there except for beautiful items which might give the impression that it is an interior design, antiques or wine shop, why not? So you’ve got to come in to find out more and the French rarely make spontaneous entrances. The French who dare to are those I met through networking, who I know, or who have seen me in the press. So that is also another aspect of the French: they rarely seek answers if they have not been provided already. While a Belgian person would not admit to not understanding something. So actually, they come in and they adhere or not with the ritual question “But what is a culinary perfumery, actually?” and I love that! Going back to your range of products, you also have French tea fragrance. Yes. That was a project I began in France. I realised that we the French with our art of gastronomy, our gastronomic culture, had never developed a tea culture of our own. According to history, we used to act according to the desires of the moment. Which are a lot more recent! Mariage-Frères is completely recent. It is a marketing concept which represents “French tea culture” but which is inspired mostly by Asian and Indian influences When you enter into a Mariage-Frères shop, you are everywhere in the world but surely not in a haven of French lifestyle. Hence it is a borrowed lifestyle. It is Indian tea which refers to this lovely tea shop. But we are not in a Louis XV drawing room. Afterwards a brand like Kusmi was influenced by Russian tea culture. They are really lovely brands but unlike gastronomy, their influences aren’t entirely French. So I wondered if what French tea would be like if conceptualised. In my opinion, it is a tea perfume, a fragrant tea. And there I merge perfectly with the house Mariages’ analysis which actually considers French tea to be fragrant due to the demands of the French palate. Hence all my teas are fragrant. And then there is also a more personal interpretation: in my opinion, it is important to have a tea that is closer to a pleasant dining experience. For us, the French, (5 o ‘clock tea) is not installed in our rites and rituals of food appreciation. Hence I thought more of a tea you would have with a meal. A tea that could approach as a wine with an oenological approach. Tea for drinking at room temperature, not hot. Why disturb it so much by heating and cooling it? It does not make much sense. Tea that should be drunk immediately also in a wine glass with an approach imagining tea pairings as we imagine wine-food pairings. That’s a very personal type of French tea! Can you give me an example of a tea- pairing? Well, all my teas are flavoured with natural essential oils. That is something which is really rare. Not many houses do that. My n°5 tea combines art, the world of perfume and the patronage of the perfumery, since it is a Cyprus harmony. In perfumery, Cyprus is always associated with bergamot, rose, jasmine and patchouli. So this starts refreshingly with bergamot, this heart which is distinctly floral with rose and jasmine – with a sweet note provided by the jasmine – and this aspect, the bottom, the lingering woody taste provided by the patchouli which I find reminiscent of a hint of gravlax salmon and new potatoes that I have cooked in this same tea. At that moment, I prepare the tea, I heat it properly of course and then I poach my potatoes in it directly, taking care to be harmonious. And a glass of tea is drunk at room temperature. It is really a good suggestion taste wise with very simple gestures since it is also the aim of this discipline. I am not a chef. I specifically did not learn about cuisine in order not to enclose myself in techniques, the academics of “what is and isn’t possible”. And so I have retained this candour and naiveté. Everything is possible for me since I am not restrained by any boundaries! I adhere to family cuisine and cuisine which is really simply in my techniques and activities. So that is for the shop aspect. Well beyond that, the requests of my clients resulted in: open tables, private tables. Clients began to ask me ‘Would you make a perfumed dinner, or a lunch?’ Well the first were more hesitant. 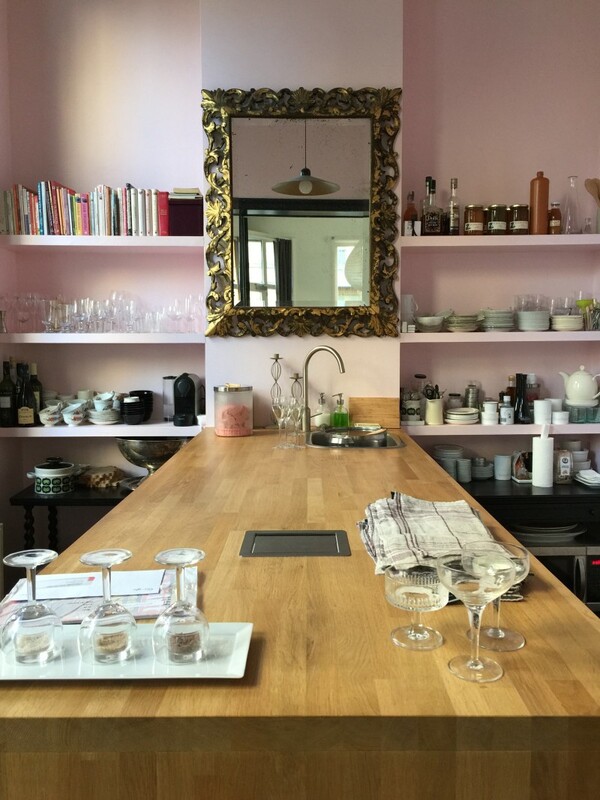 I wasn’t too aware of how to place myself between the cooker, the table d’hôte and the host … And then, over the months, a real atmosphere settled and is presently a real success! We do it a lot, always in private. So each person must form a group, a minimum of 4 for lunch and 6 for dinner. And some of life’s absolutely amazing moments take place here! Does that go on in your shop? It takes place here, on this table! I am blessed to have downstairs the equivalent surface as this shop, where I have a kitchen. Anything that is not beautiful is cooked below. Next at the reception, we have a workshop: it is very often a bread bar: you prepare a slice of bread and butter and then try out the salts perfumes and peppers without knowing what they are beforehand. It is a good initiation. And then people go to the table. I limit the group to a maximum of 10 or 12. And there, dinner is served as at home. Hence everything that has to do with fragrance, the completion of the plate, sauce preparation takes place here, in the shop, and people who want to come over to participate, to see, to ask me questions are welcome to do so. The shop is privatised, especially in the evening, and everyone feels at home in this slightly quirky atmosphere of eating in a shop. They are now moments of sharing as much as for the clients as for me. I absolutely feel as though I am inviting friends. It’s a real pleasure! And the atmosphere, I would say its friendly aspect is amplified since, my husband is usually present with me in the evenings. It feels as though we are entertaining as a couple. He takes care of the wines, serving drinks, just like when we host our friends. And we too are frequently hosting here! This is the second activity that is now central to the business, because I have noticed that people still want to find out before engaging in the act of perfumed cooking on a daily basis. And the third activity that started in February, which also began as a result of the demand of my clients are workshops, strictly speaking. Master classes on relatively short themes, one hour formats, an hour and half, on very focused themes, very specialised. The first theme discussed was precisely infusions. The infusion technique in cooking, flavouring water consistently when cooking vegetables, to make a soup, potatoes, pasta, rice, etc. How to create cooking baths. There will be others on alchemy, the game of contrast between salty and sweet, a project focusing on textures, themed around perfume harmony, the great floral categories, how to create a floral harmony in cuisine, why, around what dishes, woody harmonies in the same manner. I have 7 themes that will cover the period between February and June. These workshops will initially be held in French. I will open one or two with a Dutch translator, because I have had requests, and I love it. I think it is really a nice way of respecting the country in which I reside. It is a country with a double culture and two languages, so I play the game. I still have this project for a house which is something like a “café du commerce” in a quiet place. A house where we find ourselves, where we spend time with pleasure, and where the focus is enjoying a get together rather than making any purchases. And I always have a very pleasant contact with my customers. Besides, all my friends were first clients, since I arrived here with a relatively minimal network. So I found all these women in isolation, regardless, to be really pleasant, and the exchange was really interesting. And then one day I said to myself: what if I brought them all together? So I invited some of them. We worked in small workshops, which resulted in absolutely fascinating reflections and events. It worked well, so there it is. The Marolles (or Marollen in Dutch) is a very old neighbourhood of Brussels, in the centre, just beneath the Courthouse and the Sablon. There are lots of antique shops and a famous Sunday flee-market on the Place du Jeu de Balle. A French expression meaning a place where you can gossip, exchange ideas, philosophise without being an expert.